Do you enjoy a glass of smooth red or white wine after a long day? However, you can't just have a glass or two without worrying about wasting the rest of the bottle, as the wine will go bad on exposure to oxygen. That is why we created Wine Squirrel- a decanter that preserves the rest of the bottle, for weeks at a time- without losing its flavor! The key to the effectiveness of the Wine Squirrel decanter is the unique patented sealing mechanism. This mechanism provides an airtight seal that prevents oxygen from spoiling the wine. The seal is so effective that you can even store the decanter horizontally or flip it upside down without spilling a drop! 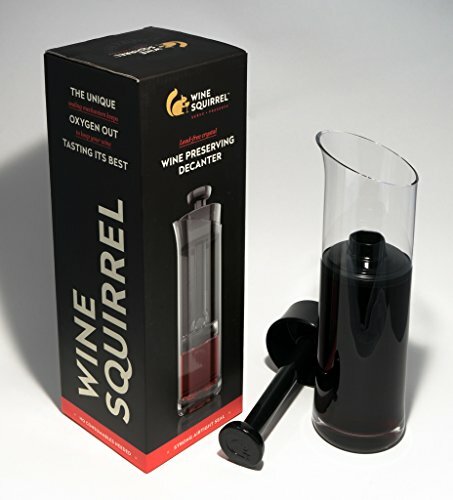 We have put the Wine Squirrel decanter through rigorous testing using different types of red and white wine. What we found was that this is the only solution that is both effective and affordable. The Wine Squirrel decanter is the perfect accessory for the nights you want to have just one glass of wine with dinner or when you and your partner want to have different wines or when you would like to have white wine with your first course and red wine with your second course. With Wine Squirrel you can open a bottle of wine confident in the knowledge that the remainder will be perfectly preserved for the next occasion. A revolutionary wine preserving decanter with airtight sealing mechanism that keeps wine tasting great for weeks at a time. If you have any questions about this product by Wine Squirrel, contact us by completing and submitting the form below. If you are looking for a specif part number, please include it with your message.